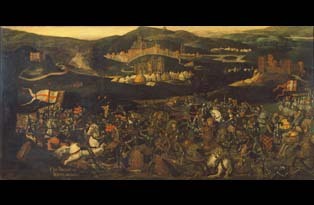 On 16th August 1513 the Battle of the Spurs took place. The battle was also known as the Battle of Guinegate and it was part of the War of the League of Cambrai. The battle saw the English, led by King Henry VIII, and the Holy Roman Empire, led by Maximillian I fight together against the French. In May 1513 English soldiers arrived in Calais to join up with the army that was led by George Talbot, Earl of Shrewsbury, who had been appointed as Lieutenant General on 12th May 1513. 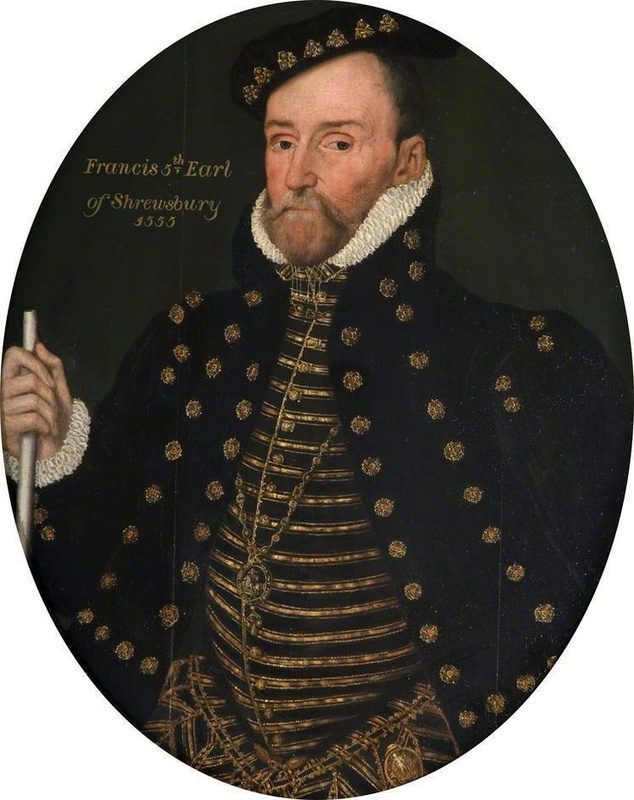 On 17th May King Henry VIII announced to the Cinque Ports and the Constable of Dover Castle, Edward Poynings, that he would be joining the troops in France and would leave his wife, Catherine of Aragon, as Governor of England. The Chronicle of Calais records that troops began arriving from 6th June, with all the troops in place at the end of June they set off towards Thérouanne with Shrewsbury leading a vanguard 8,000 men strong and Lord Herbert, Charles Somerset, commanding the rearward that consisted of 6,000 men. King Henry arrived in Calais on 30th June with an army of 11,000 men provided by Cardinal Wolsey. Henry’s army contained cavalry, artillery, infantry and longbows. Henry set off towards the battle led by 800 German mercenaries that had been recruited to the battle. When Shrewsbury arrived at the town of Thérouanne they set up the artillery battery and mines where they could lay explosives but throughout July little progress was made between the two sides. Eventually the town held by Antoine de Créquy surrendered and the French suffered a huge set back. Margaret of Savoy noted that two men were governing everything during the skirmish; this was Charles Brandon and Cardinal Wolsey. During all this Henry was camped to the east in a heavily defended camp. Henry’s accommodation was a wooden cabin with an iron chimney and surrounding that were large yellow and white tents. The Emperor Maximillian arrived in France in August 1513 and stayed at Aire-sur-la-Lys, Henry arrived in Aire-sur-la-Lys on 11th August dressed in light armour whilst his retinue wore cloth of gold which was a big difference to Maximillian’s retinue who were dressed in black still mourning Bianca Maria Sforza, Maximillian’s wife. Upon hearing that the two leaders had met Catherine of Aragon wrote to Cardinal Wolsey that she was delighted as it would be an honour for Henry and help Maximillian’s reputation. King Louis XII of France wanted the French to attempt a second battle in order to break the siege, it was organised for 16th August with the cavalry grouping at Blangy. The French army consisted of gendarmes and pikemen. In response to the this the English had their engineers work overnight constructing five bridges over the River Lys to allow their army to move freely, meanwhile King Henry moved his camp to Guinegate on 14th August after his army were able to displace a company of armed horsemen who were stationed at the Tower of Guinegate. The French still in Blangy devised a plan to split their army into two one to be led by the Duke of Longueville and the other by the Duke of Alençon. Alençon’s force began by attacking the positions that were being held by Lord Shrewsbury whilst Longueville attacked Lord Herbert. Both of these attacks were to act as a diversion to allow the stradiots to deliver supplies to Thérouanne. The French were hoping to catch the English unaware by setting out before dawn; however, a small cavalry from the Scottish borders were already out patrolling and detected the two troops moving. Henry sent out a vanguard consisting of 1,000 men and then followed them with between 10,000 and 12,000 men. With the French alerted to the fact that the English already knew they were moving the troops decided to wait on a hillside to regroup and wait for the stradiots to contact the garrison within the town of Thérouanne. Whilst they waited on the side of the hill the English vanguard approached from the front with archers shooting from nearby. This was the first time the French became aware of the size of the English army. The English charged as the French were moving off, throwing the French into confusion. As the French were in disarray the stradiots who had attempted to reach Thérouanne were fleeing from cannon fire and crashed into the French cavalry. Whilst La Palice tried to regain control over his troops they were fleeing so quickly that in order to gain more speed they throw away lances and standards and the gendarmes even cut some of the heavier armour from their horses. The English chased the French for miles until they reached Blangy. Whilst this was happening Sir Rhys ap Thomas fought the smaller French troops between the village of Bomy and King Henry’s encampment at Guinegate. With the battle over it was time to assess the casualties many French prisoners were captured and reports of approximately 3,000 French casualties. It was reported that nine French standards were captured as well. With the threat of a French counter attack now dealt with Henry’s camp once again moved south and on 22nd August the town of Thérouanne fell and Henry was welcomed into the town by Shrewsbury. With the town captured it was time for the army to turn its attention towards Tournai.